Are wind farms a good way to solve the energy crisis and global warming? Power from wind farms seems like it would be a very good solution to at least some of our energy needs. Wind, though unreliably fickle, is free, does not require mining, and is clean. Also, windmills and generators have been improving to make this technology more economical. Currently, wind power supplies about 0.1 percent of the world’s electricity, but that is growing at a rate of about 30 percent a year. There are problems with wind farms, however. For one thing, the giant windmills you find in places like southern California kill birds and other animals. Any hapless bird who flies near one is apt to be chopped into bits. Some conservationists are worried this could actually kill some birds on the endangered species list. A 2002 study conducted in Spain of its wind farms noted that 350,000 bats, 3,000,000 small birds, and 11,200 birds of prey were killed by windmills and associated power lines in just one year. The Altamont Pass Wind Resource Area near Palm Springs, California, which consists of 4,900 windmills, is responsible for the deaths of 4,700 birds annually (about one per windmill), including 1,300 raptors (birds of prey) such as burrowing owls and golden eagles. Because of increasingly limited land space, some countries are building wind farms offshore. For example, England is constructing a new wind farm that will cover 145 square miles (375 square kilometers) off the Kent, Essex, Clacton, and Margate coastlines. Such offshore farms, of course, now pose a threat to seabirds. Another fact is that wind farms take up a lot of space. Situated on hillsides and open plains, they effectively destroy what could be wildlife habitat. Each windmill takes up about 1,600 square feet (144 square meters) of space. Furthermore, building the vast wind farms needed to power cities takes a lot of resources, including the steel, concrete, and other materials needed to build and maintain windmills and the oil and gasoline that is burned during construction. Many people think that wind farms are one solution to the energy crisis and global warming. 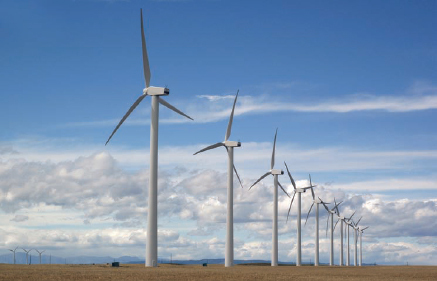 However, even wind energy can have a negative impact on the environment and wildlife.